CareSearch celebrated its 10th anniversary on 3 August 2018 to highlight the importance of evidence-informed palliative care. As the demand for palliative care in Australia increases, so too does the need to ensure that patients, their carers and families, health practitioner and aged care providers have easy access to trustworthy, evidence-based information. “Evidence is crucial in providing the most optimum, person-centred, and quality palliative care,” according to Professor Jennifer Tieman (CareSearch Director). “Evidence enables us to ask informed questions and make better decisions. It helps patients, their carers and families, doctors, nurses, allied health professionals and the palliative care workforce understand the potential benefits and harms of a treatment or intervention. Evidence also serves as a strong basis to drive continuous quality improvement,” she added. CareSearch is an online resource designed to help those needing relevant and trustworthy information and resources about palliative care. “For 10 years now, CareSearch has been enabling Australians to make informed decisions by providing access to trustworthy information and best available evidence. The event highlights the importance of evidence-informed palliative care and the achievements and future plans of CareSearch,” Professor Tieman stated. In honour of CareSearch’s 10 year anniversary a publication was produced. View a copy of the publication online or if you are interested in receiving a copy, please email CareSearch Marketing Assistant Samantha Parker at samantha.parker@flinders.edu.au. 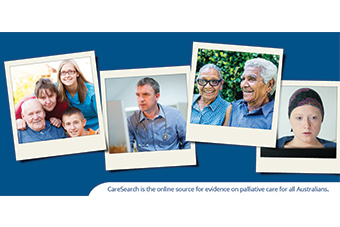 Visit www.caresearch.com.au to find the updated and best available evidence on palliative care.